Qualification-Master degree in Social work or Sociology or Economics + Five years field experience + Hindi or Sanskrit upto Matric standard. Age-30 to 45 Years.Age relaxation as per Govt. of Haryana rules. Application Fee-For Male candidates of General category and male candidates of other State-500/-. No application fee for Physically Handicapped candidates (with at least 40% disability). 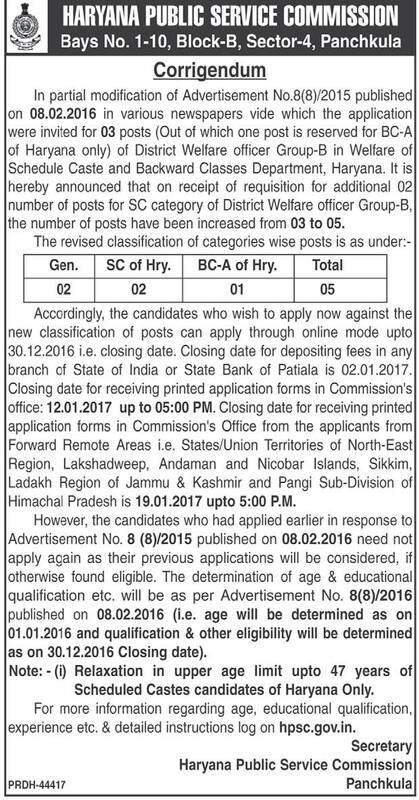 Place of Posting:- Anywhere in Haryana.The selected candidate must be prepared to join duty immediately after selection.